The nationwide shortage of truck drivers is no secret. Employers across the industry are searching for new ways and innovative ideas to attract and retain drivers. At Truck Driver Retention by People Element we work to help you understand what keeps drivers engaged and share ideas to achieve these goals. 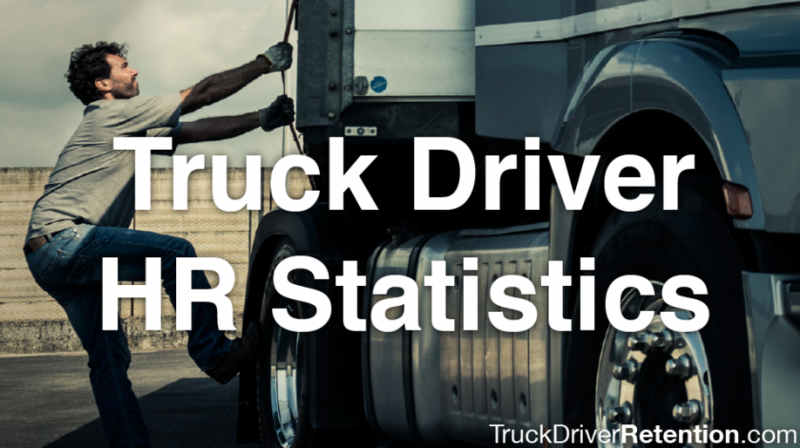 To understand drivers, it helps to understand the industry which is why we assembled these great truck driver retention statistics. According to the American Trucking Associations, turnover is still above 90% and rising (up 1% in the first quarter of 2014). This high turnover rate has stayed above 90% for more than nine consecutive quarters, leaving up to 35,000 unfilled jobs with for-hire carriers. Updated statistics as of April 2015 indicate the driver shortage could be as high as 40,000, with a 95% turnover rate for small truckload carriers and a 96% rate for large truckload carriers. Labor statistics across the United States indicate a nationwide quit rate at around 2 % (as of January 2015), which means trucking is in a unique situation as employers. Finding and keeping qualified drivers is not just important for the present, but also for the future. The expected growth of heavy and tractor-trailer truck drivers is an increase of 11% from 2012 to 2022. This long-term outlook is comparable to an 11% industry growth across all US occupations and a 9% growth in basic motor vehicle operators. As the industry overall grows, households will increase their spending on goods. Since most freight is shipped by truck, this will place an increased demand on industry supply chains. Different freight services require different amounts of drivers. The Bureau of Labor Statistics considers Heavy and Tractor-Trailer drivers those that require a commercial license and have a capacity to drive a vehicle of at least 26,000 lbs Gross Vehicle Weight. Of these drivers, the vast majority work as general freight truckers (577,090). The next highest population of drivers (277,590) works in specialized freight like heavy haul and oversized loads. A much smaller portion of workers is dedicated to specific industries like grocery, cement, and specialty contracting, with 36,000-60,000 drivers each. While certain industries may have the most truck drivers total, these drivers may represent a higher number of employees for some than for others. As no surprise as the industry leaders, truckers represent 61% of general freight employees and 53% of specialized freight crews. While employing less than 35,000 truckers, Road transportation truck drivers account for 39% of total employees. Cement and concrete truck drivers represent almost 30% of the employee population. Petroleum and petroleum products truck drivers have the fifth highest concentration with 22,800 drivers representing about 24% of industry employees. While the driver shorter may be nationwide, some states may be luckier than others. The state that employs the highest number of drivers is Texas, with 157,260 workers, followed closely by California with 126,490. These states may be no surprise, with so much industry and wide open spaces, including Florida with 67,340 drivers, but other states may be less expected. Pennsylvania ranks third from most drivers nationwide with 71,970. Illinois comes in fifth with 66,050 but is surrounded by high driver populations in the neighboring states surrounding the great lakes. While the highest number of employees follows states with high populations, some smaller states may surprise you. North Dakota has the most truck drivers per [employee] capita representing 15,310 workers and 36% of the state’s employment. Neighboring states Nebraska and Wyoming also rank highly with 28% and 25% respectively of employment being truck drivers. Arkansas maintains a strong percentage of drivers with 32,960 employees representing 29% of the states workers and Iowa rounds out the top five with 25% employment. In order to stay competitive, employers are finding different ways to reward dedicated high-performers including different types of pay. The American Trucking Associations conducted a driver compensation study in 2014. Surveying 130 fleets and over 130,000 drivers including Private, For-Hire TL, LTL, and Drayage. The results showed that the vast majority of fleets pay drivers in multiple ways, taking into account both mileage and time. By including additional compensation methods, employers are able to offer drivers more competitive pay rates based on route difficulty and level of performance. Truck Driver Retention experts at People Element have been industry leaders in gaining employee insight, and no area is more important than understanding why drivers leave. While lacking satisfaction with compensation is an obvious reason for driver turnover, there are other reasons drivers may choose to quit. 19% of Respondents surveyed cited scheduling reasons including home time and hours worked. 17% of workers left a company due to management or environmental reasons like politics, leadership, and recognition. 15% of drivers expressed dissatisfaction with the routes themselves, including dispatch and equipment issues. 13% of drivers left due to issues with policies, communication, or training needs.